A few too many superlatives you might think? Right. But sorry, I have to tell you the truth. This is just the place to be – and you won’t even be disappointed by the food. Let’s talk location: The Mini Palais, situated in the Grand Palais, opened last fall. The spot is so amazing, that you would expect the kitchen to be just mediocre. They actually could serve the worst muck at inflated prices here, a full house would be guaranteed. The tourists would come anyhow. They’d only come once, but who cares? The venue is actually within walking distance of the Champs-Elysées and just around the corner from Paris’s most popular exhibition space, the Grand Palais (inside it, to be exact.) The thing is, this stunning dining room that looks like a very postmodern version of an artist’s atelier with floor to ceiling windows overlooking a lovely terrace framed with arcades, is just one of the most beautiful you can currently find in Paris. The famous and most successful couple of interior designers, Dorothee Boissier and Partick Gilles, signed it. 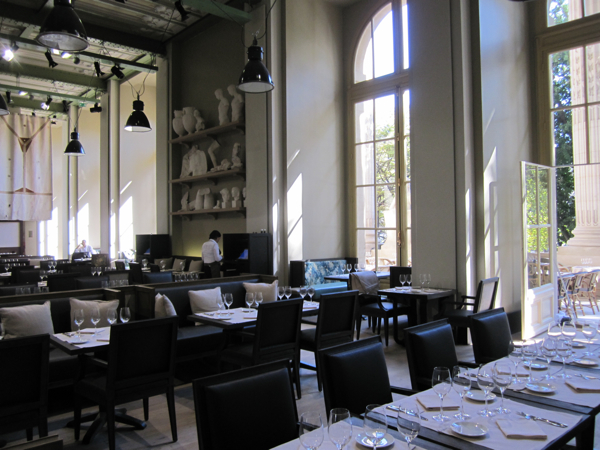 There is the old structure, 8-meter high ceilings, cast iron beams, but Gilles & Boissier managed to give the place the little postmodern twist making it charming, if not to say cosy. 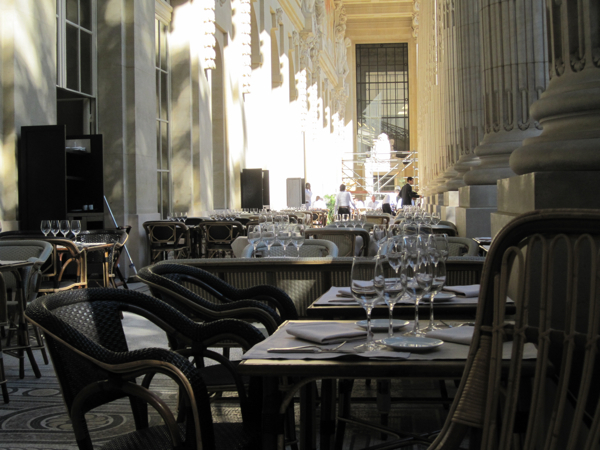 And then there is the terrace: arcades, mosaics on the floor, wicker chairs, linen sofas and a view onto the Petit Palais just opposite. The Belle Époque? I wouldn’t be surprised if Marcel Proust walked in for a tête-à-tête with the Duchesse de Guermantes. But let’s talk food too: Éric Frechon, decorated with three Michelin stars at Le Bristol, signed the card and he’s keeping a careful eye on Stéphane d’Aboville, his 30 year old disciple who spent several years with him in the kitchen of Le Bristol. But as much as his Haute Cuisine might lack inspiration – “no angel has ever crossed his path” we noted after a disappointing dinner for 700 Euros at the Bristol -, all the more you have to admit that Mr. Frechon is a perfect technician. 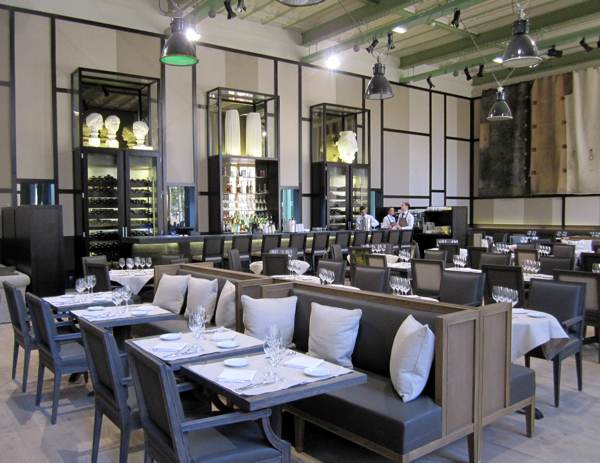 Could it be possible that he just feels much more comfortable with a modern, revisited bistro cuisine and it’s slight touch of fusion than with dazzling the bourgeois? 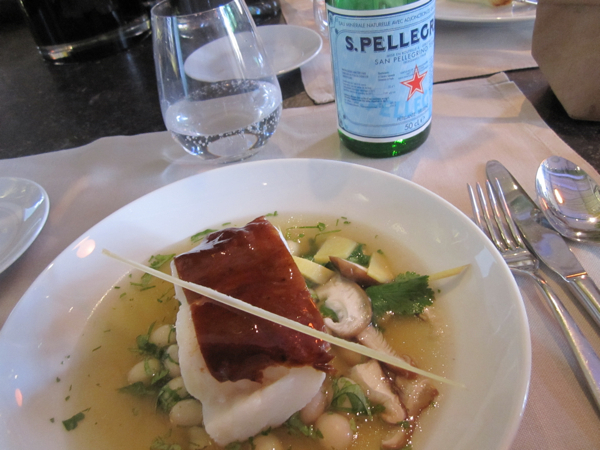 I had a wonderful piece of cod for lunch, poached in a bouillon with ginger, coriander, and lemon grass. I couldn’t help myself imagining the huge cod lying in the ice of Rungis the very same morning. In other words: the product was exquisite, the preparation perfect and the taste just the little Asian twist that makes a light lunch joyful. At the Mini Palais they are not kidding with the quality of ingredients: Bordier butter, cold cuts from Yves Camdeborde, delicious bread from Fréderic Lalos. Namedropping? In a way yes, though the best products you can find in France. The tartar is just excellent, the revisited burger with foie gras was approved by experts, and my picky American table companions who just had attended the Chanel fashion show where delighted with their plat du jour. The latter you get in a 28 Euros menu either with a starter or a dessert. Don’t forget to book. In particular when big exhibitions or fashion shows are scheduled in the Grand Palais.